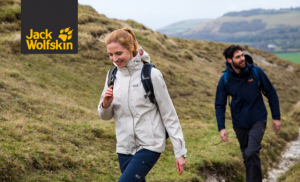 The JACK WOLFSKIN x National Trust collection reflects our shared values of environmental protection and care. Each piece in the range is free from PFCs*, using alternative treatments for a DWR (durable water repellency) so that water drips off without environmental harm. Named after some of the National Trust’s most iconic and diverse natural landscapes. The Langdale Fleece (Men, Size M) for example, is made from 15 PET plastic bottles (1L) and the recycled material is certified by the Global Recycling Standard. The collection also features JACK WOLFSKIN’s innovative Texapore Ecosphere membrane. This waterproof-breathable membrane is the world’s first 100% recycled membrane, manufactured from remnants from the production process. As a Fair Wear Foundation member with leader status, JACK WOLFSKIN works in close cooperation with its supply chain partners to ensure fair and safe working conditions. The collection will be available online and from selected stockists (JACK WOLFSKIN stores, Cotswold Outdoor stores and National Trust shops) from mid-April, 2019. Every purchase supports the work of the National Trust to look after the great outdoors.